December is associated with Christmas almost all over the world and Norway is no exception. Those who have already celebrated Christmas in Norway may be familiar with the traditions, but there are always new aspects of it to discover. For newcomers to Norway, we hope that you experience the best of what Norway has to offer during the Yuletide festive season: julebord, julemarkeder, juletrær, julekaker, julemat, julekonsert, julestemning and so on! Advent is the Latin word for ‘arrival’ and is the time for Christmas preparations. Norwegians bake cakes and biscuits, buy gifts and clean the entire house. This is also the time for decorating and the closer we get to Christmas, the more Norwegians decorate. Windows are decorated with red ribbons, stars and candles, angels and anything else you can imagine. A more recent tradition is to decorate with lots of electric lights outside: trees, balconies, terraces, doors and many other places. 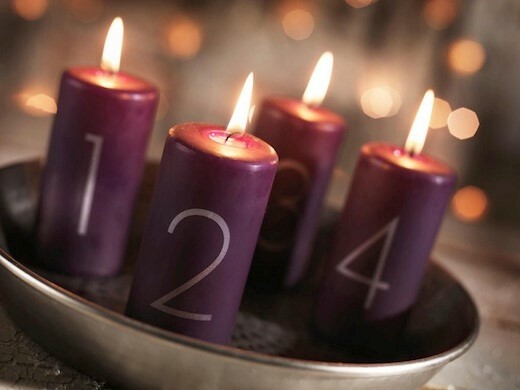 The tradition of lighting one candle on the first Sunday of Advent and continuing each Sunday, until all four are lit on the last Sunday before Christmas, is approximately 100 years old. Almost everyone in Norway has a four-armed candelabra and lighting the candles on Advent Sunday is what really gets Norwegians into an early Christmas spirit. Other Christmas traditions are the Advent calendar, the wreath and the Christmas tree, originally from Germany. Lucia is the patron saint of light and is celebrated on 13th December. 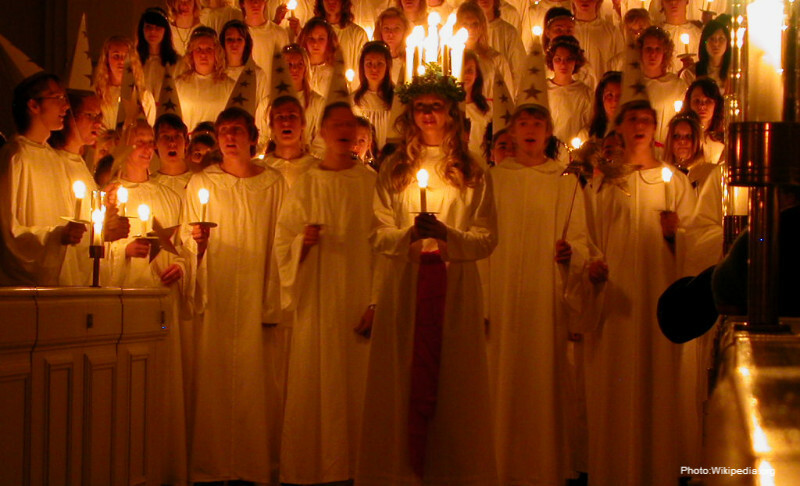 The modern way of celebrating Lucia is originally a Swedish tradition adopted by Norwegians. Small girls and boys dressed in white and holding candles celebrate Saint Lucia and sing the darkness away. Parents are often invited to the kindergartens in the morning, to watch their loved ones sing and to eat “lussekatter”. Walking around the Christmas tree after dinner is an old tradition in Norway, but still alive, particularly among families with children. 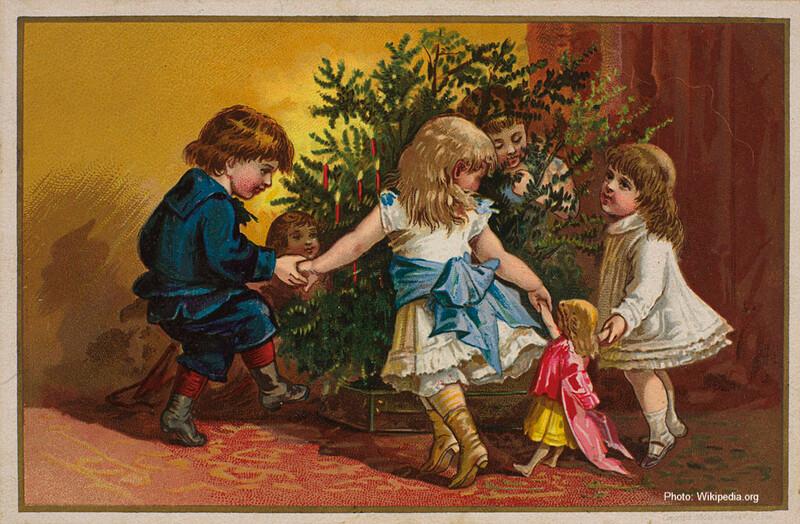 Everyone joins hands to form a ring around the tree, walking around the tree singing carols after the Christmas dinner, usually before opening the presents. 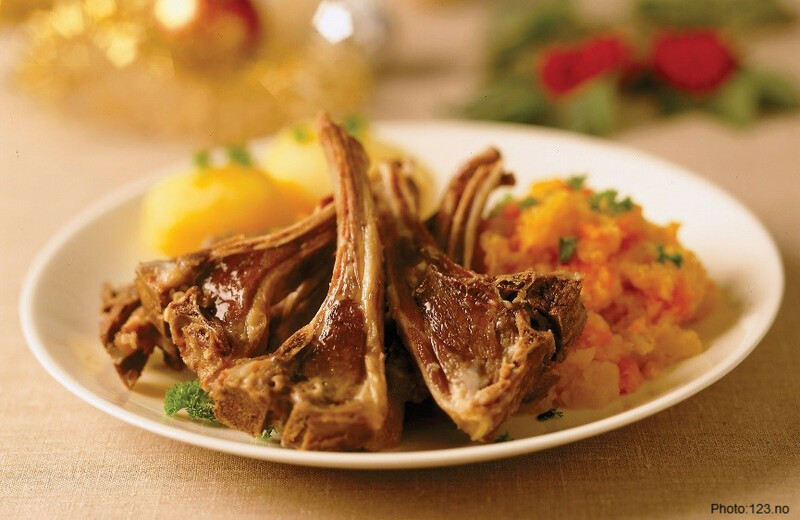 Ribbe, Lutefisk and Pinnekjøtt are the three most traditional diches on Christmas Eve and during Christmas in Norway. Below you will find recipes for all three. Enjoy! 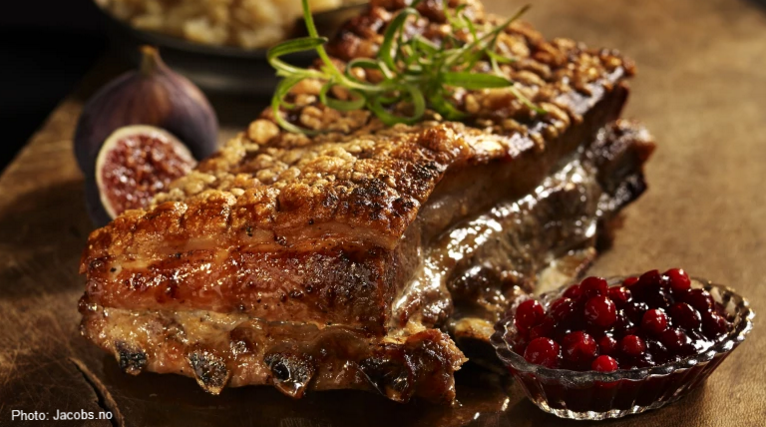 The Ribbe (roast pork rib) is a classic on the Norwegian Christmas table, eaten mostly in the Eastern part of Norway. You either love it or hate it, praise it or ridicule it. 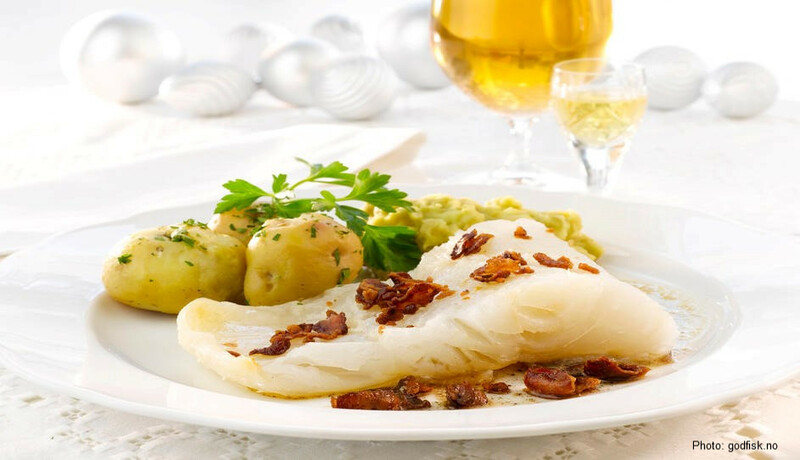 Norwegians consume close to 3000 tons of lutefisk each year! Pinnekjøtt is one of the must-have traditional Norwegian Christmas dishes. It is made from ribs of lamb or mutton that has been salted and dried, and so it has a very strong flavour. Norway has a great variety of Christmas cakes and biscuits (“julekaker”). Traditionally, the woman of the house was expected to bake at least 7 different types of “julekaker”! These are different in each county but the most common are “pepperkaker” (ginger snaps), decorated with icing sugar frosting. They can also be used for decorating both windows and Christmas trees. Another tradition is to bake a miniature gingerbread house, decorate it with candy and use it indoors (quite similar to a Jack-O-Lantern). 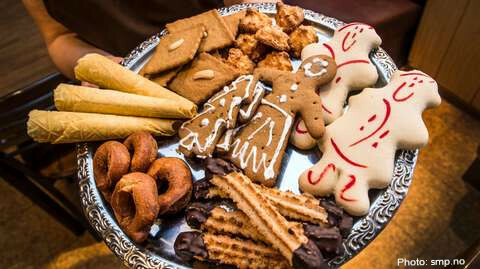 Other common biscuits and cakes are “smultringer” (doughnuts), “sirupssnipper” (syrup snaps), “sandkaker” (sand cakes), “lefsekling” (griddle cake, filled with an icing of butter, sugar and cinnamon), “krumkaker” (“curl cakes”), “brune pinner” (“brown sticks”), “kokosmakroner” (“Coconut macaroon”) “mor monsen” and “berlinerkranser” ("Berlin wreaths"). The traditional Christmas food, “Julemat,” is also served at “Julebord” when friends and colleagues from work gather around late November/early December to celebrate and have a good time together. Nearly all Norwegian breweries produce a traditional Christmas beer - “juleøl” - which is darker, stronger and has more flavour than common Norwegian lagers. There is also a special soda - “julebrus” - which may be a red raspberry or orange flavoured soft drink. Usually, both drinks are present at the “juleaften” feast table. The Norwegian Liquor “Akevitt” is a must for many Norwegians. This is extremely strong, but Christmas would not be the same without it! A couple of shots of Aquavit are necessary in every meal during Christmas (it is actually not shot straight down, only sipped during the meals, unless you feel inclined to do so…). 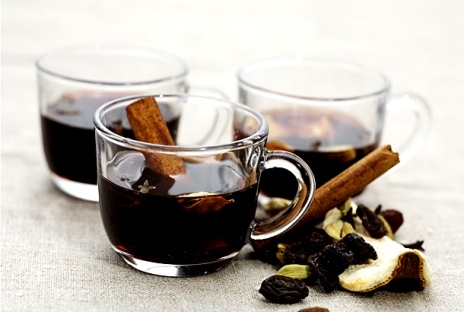 “Gløgg” (mulled wine) is a drink with spices and served hot or warm. This is a traditional drink during winter, especially around Christmas, when you have it together with “pepperkake” (ginger snaps). Non-alcoholic gløgg can be bought ready-made or prepared with fruit juices instead of wine. The main classic ingredients of alcoholic gløgg are red wine, sugar, spices such as cinnamon, cardamom, ginger, cloves, and bitter orange, and optionally also stronger spirits such as vodka, aquavit, or brandy. Gløgg spice extract and ready-mixed spices can be purchased in grocery stores throughout Scandinavia. There is no Christmas in Norway without riskrem! This sweet course is on the dessert table of almost half the Norwegian population on Christmas Eve. Rice pudding is a rich and delicious dessert with a long tradition. Top it with a good red sauce and it will be excellent! Choose between the traditional red sauce and the red berry sauce. Give the red lemonade and water a quick boil in a saucepan. Stir the corn flour into the cold water and add it to the boiling mixture in a thin stream while stirring. Once the sauce boils, put it aside and let it cool. Boil water, add the sugar and stir until the sugar has dissolved completely (syrup). Pour the syrup in a blender or food processor, add red berries and mix it all together. Whip the cream, sugar and vanilla sugar until fluffy. Mix in the cold rice pudding and the almonds. 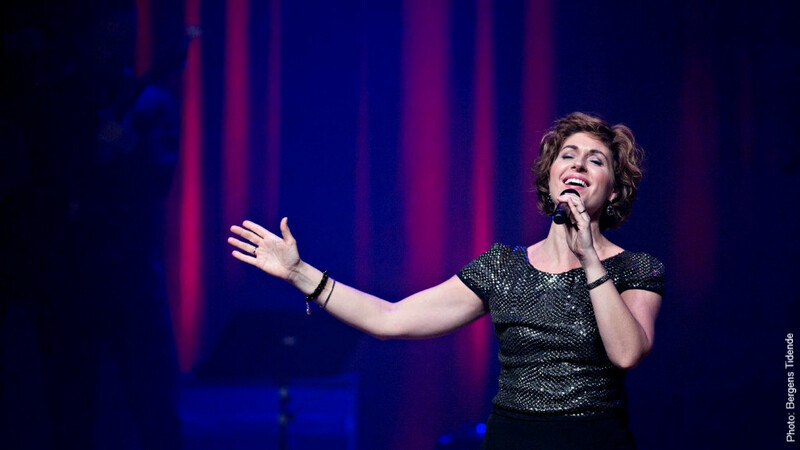 As in many European countries, most Norwegian towns and cities also offer Christmas fairs and markets, seasonal concerts and performances during this time. Oslo has many great events and markets open to the public. Bergen is famous for its Gingerbread Town, holiday concerts and other festivities. The wooden town of Røros is a truly magical place to visit during the Christmas month, and Tregaarden's Christmas House in Drøbak is a must-see as Scandinavia's only permanent Christmas shop. Hadeland Glassverk outside Oslo, also has an all-year Hadeland Christmas Shop, where visitors can purchase handmade glass from local artisans. According to Travel & Leisure Magazine, Tromsø is one of the best places in the world to spend Christmas. A chance to view the Northern Lights and to say you have been to the Arctic Circle for Christmas. Visitors can enjoy dogsledding, great food, and a mountaintop cable car. The time between Boxing Day and New Year’s Eve is called “romjul”. This is the time for a tradition called “Julebukk” (literally, “Christmas goat”). Children dress up in wonderful disguises and visit neighbours’ houses singing Christmas Carols. For this they normally receive nice treats. December 25 is a very quiet and relaxed day and church services are often well attended. The old tradition of a very early service before breakfast has been replaced in most areas by a service later in the morning. December 26 is yet another day of festivities. Cinemas, night clubs and bars are full, and there are lots of private gatherings and parties, where all kinds of traditional Christmas food, cakes and sweets are enjoyed. Fattening, tasty dinners are also part of it! Make sure the tree is fresh and fully green when you buy it. The needles along the stem should not be brown or dry. 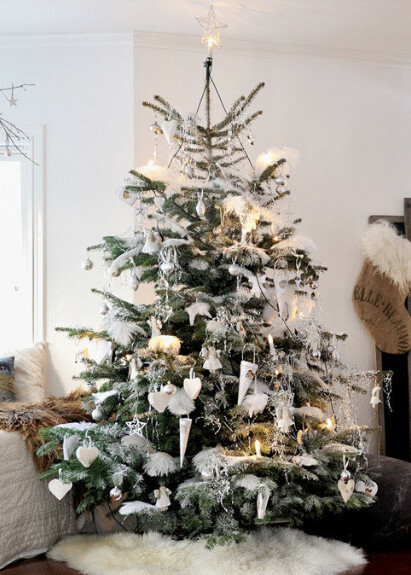 The tree should not be taken into a warm room right away, but kept in a chilly place to acclimatize for a day or two. Make a cut in the bottom of the tree trunk in order for it to soak up water and keep the stand filled. That way the needles will not fall off right away (or so they say!). 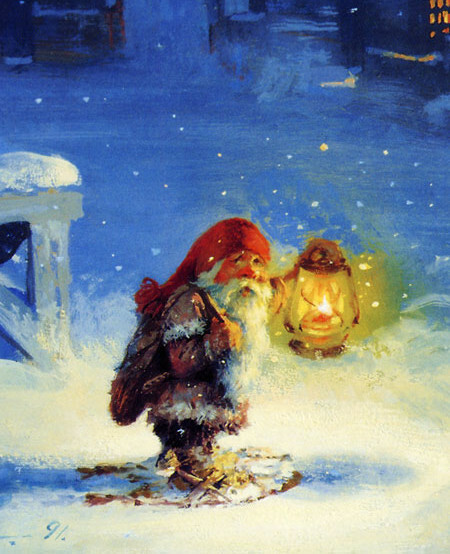 The Norwegian ”Nisse” probably derives from St. Nicholas, but ”nisser” - elves (or gnomes) - are old figures existing long before the birth of Christ. There are several types of ”nisser” in Norway. The most famous is probably the ”Fjøsnisse”, which takes care of farm animals. He is very short, often bearded, lives in a barn or stable and wears wool clothes and a red knitted hat. He often plays tricks and scares people by blowing out the lights in the barn or scaring the farm dog at night. He can be very friendly with the people living on the farm, as long as they do not forget to give him a large portion of porridge on Christmas Eve. If they do, he will play all sorts of tricks, like moving the animals around or braiding the horses’ mane and tail. There is of course also a Christmas nisse (“Julenissen”) which is more or less identical to Santa Claus. The ”Julenisse” brings presents to all the nice children on Christmas Eve. He is not as shy as the traditional Santa Claus, though, since he delivers the gifts himself and does not come down the chimney in the middle of the night. Most shops have extended opening hours in December and some shopping malls are open until late on weekdays. Many shops are also open the last three Sundays before Christmas, between 14–20, but this can vary from shop to shop. The shops are closed on 25th and 26th December, and close early 24th and 31st. The days between have normal opening hours. Julebord events, or “Christmas Table” as it translates into in English, take place pre-Christmas all over Norway. They usually are arranged from the last week of November going well into December. The term refers to a party, either a private or corporate gathering, where people get together and enjoy Christmas food, often served on a buffet table. The dishes are usually both hot and cold, and a variety of traditional and more modern plates. Many times the Julebord will be arranged at public restaurants, and is the preferred serving method in this instance. The idea behind the Julebord is that the pre-Christmas period should not only be about stressing around buying gifts, cleaning and decorating the house, baking the 7 different required cookies, etc. but also to sit down, relax and enjoy a nice evening with friends. Don’t be taken by surprise if you meet very happy (and not so sober) Norwegians singing on their way home late at night. The explanation is simply that they have been to a ‘julebord’!